We only have 10 years for saving the earth.....Therefore, Green Man has given up his doctors' practice in order to help you transform the world. He will tell you how to change your own life to begin with. 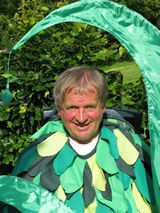 His motto: "Once you make a shift from having to Being your whole life will be turned upside down: from stress to joy; from boredom to challenge; from burn-out to renewal; from indifference to enthusiasm; from loneliness to friendship......"
"Once you are available to the Whole, the Whole will be available to you"
Therefore, invite the Green Man to your group, organization, centre, church, temple, commune, forum, conference or board, worldwide. He will be sharing his unique wisdom with you. It is urgent! Several times I tried to have an interview with Han Marie Stiekema. Every time my request was declined. Surprisingly, a few days ago, the Teacher called me and said that the "Hour of Truth" had come and that he was prepared to meet me. So I made an appointment with him. Q. Thanks for having invited me. Obviously, I got very much intrigued by your "Hour of Truth". What did you mean by it? A. It is simply the "Hour of Truth". Never before mankind faced a challenge like today. We all have to wake up. Looking at myself, I know how slothful I am in this regard. Leaving behind all trivialities and make yourself available to the Whole, that is where it is all about. Q. If it took such a long time with you, what about all other people? A. Everybody has his or her personal background e.g. obstacles to overcome. With me it was the fear of showing my "Original Face" to the people. It is much more easy to keep small, not to become a target of criticism, ridicule, rejection and worse. Q. So, like the famous text of Marianne Williamson - the fear to be shining and strong - the one quoted by Nelson Mandela? A. It is more than that. The crisis requires, that you come out with your whole Being, not holding back anything. Indeed, with your inner Truth. The more you have been granted, the greater your responsibilities toward the Whole. Q. You once said we have to become successors to Jesus, rather than followers. Q. Isn't that a thing of the past? A. Fortunately, less and less people feel like being a sinner. However, the taboo on being deeply ourselves has remained. That's why we "forgot" to make the necessary second step: to restore our True Self, to realize our Divine Spark within. Q. Is this the quest for everyone, despite individual differences? A. Right. The problem however is, that individualism and materialism have spoilt the whole culture. Even something sacred like spiritual Realization - Enlightenment - has become the object of greed and power. So, liberation as we know it has become a dead end. Q. Is that an additional reason why you have decided to stand up? A. Yes, it is. Somebody has to take the initiative to showing the way out. What was so frightening to me was that I really did everything - searching for many, many years - to find somebody who has the answers. There doesn't exist such a person. Q. Which made you conclude that it was......you? A. Look, while you are saying this, something within is still shrinking. But indeed, it is like you say. Obviously, my mission was first of all revealed through my Great Experiences. Actually, I have known this intuitively already from early childhood. A. The core of "Evolution of Consciousness" is, that time and again somebody pops up who has gone deeper than any of his predecessors, and that is the case here. Q. So, the Great Teachers of existing religions are a thing of the past? A. Even dominating religions are only fruitful if they can bring about great progress to the evolution of mankind. Without that they cease to be the driving force of the culture. As is the case with Jesus' and Buddha's teachings, for instance. Q. Isn't the message of love applicable to all times? A. Countless teachers of many traditions have preached the same message. It didn't prove to be sufficient to upgrade the consciousness of people. In the case of Jesus it was the Church who sabotaged his teachings from the beginning. Not surprisingly thus, that at least in Europe "religion is dead". Q. Jesus the victim of his own Church? A. In order to understand the problem you have to know that there are two Jesuses. First of all the real one, and secondly the one created by the Church. A. The real Jesus was a very kind man, who became an initiate to the Old (Mother) Tradition and a follower of Mary Magdalene, a Canaanite priestess. That's why she anointed him. After that he became the candidate for the mission of "dying and resurrecting God", like Tammuz, Osiris, Attis, Baal and Dionysos before him. Q. So, he wasn't that unique beginning like the Church is claiming. A. Right. Later I will elaborate on that, if you allow me. Q. I look forward to it! A. Subsequently, like so many others before and after him he was granted God-Realization, e.g. the recognition of his Divine Essence*. This happened on the Tabor mountain. * That doesn't mean being God. See later. A. After his Experience he "returned to the world", while starting his healing and teaching activities. Although being a follower of the Mother he could not openly talk about Her, obviously, because of the repressive Jahwehnist culture around him. He manifested it in his inclusive approach to women. Q. The Church claims Christ is "God", though. Aren't his sayings like "I Am Who I Am" and "I am the Way, the Truth and Life" not proof of his Divine descent, like Christians claim? A. The Church emphasizes that Christ is both God and human. And they are right! But this isn't limited to him (at all). The sayings mentioned above could be said by all who have experienced God-Realization. They refer to our deepest Being, which is Divine, not to our ego, small self or limited personality. Q. You wouldn't use the word "God" I suppose. A. Correct. The reality is that the Divine is Omni-Present. It IS in everything and all. Also in you and me. It means, that everybody is both Divine and human. To attribute these qualities to Christ only, is therefore a deliberate falsification. A. It makes people depend on a savior from outside, rather than to go within and find their liberation there*. It is a strategy of the Church to make people depending on its "salvation". Q. So, God (the Father) "having sent his Son to the earth in order to redeem us from sin", is equally untrue? A. It has made our dependency on the Church even greater. Who wouldn't be eternally grateful to a man who dies for you? It gave the Church all the instruments to manipulate its flock. Q. Still, the Church encouraged to follow Jesus. Isn't that a sign that it stimulated people in emancipating their lives in order to bring it to a higher level? A. To an institution that is obsessed with power politics God-Realization of its followers is a threat. It makes the former superfluous. A. So, for the Church "God-Man" wasn't enough. In order to overpower e.g. crush all competitors (a.o. Buddhism! ), it attributed qualities to Jesus he didn't possess: being God. Q. So, again, could you please explain what exactly is the difference between God-Realization and being God? A. Meister Eckhart, the greatest Enlightened One of all times, formulated it quite to the point. He said: "human beings (bodies) can only be exposed to Divine Presence for a limited time. If longer, the intensity of the latter's Light will burn them to ashes". It is like a butterfly coming too close to the lamp. A. So, God-Experience may happen, but always for a limited time. It subsequently "retires" and remains on the background. Hence, humans are indeed Divine, but cannot constantly actualize it. A. Only the Essence is Divine, the rest is human, so no ANY human can claim he or she is God. Actually, Jesus never did so. It was the Church who made him part of its power game. A. As long as the Church had the power, this "worked". From the first moment its power weakened the belief weakened accordingly. It proves that the faith had been imposed on people. Once freed from oppression, people followed their own insights. Q. Who were not altogether stupid! A. The irony is, that generally your strongest points sooner or later become your weakness. So, those attributes that should have made Christ invincible "for ever" and superior above all and everything, caused his downfall, eventually. Now the Church is facing the consequences of its own luciferic aspirations. A. Yes and no. Having been misused and exploited for such a long time isn't very funny, indeed. On the other hand, he now has the opportunity of occupying his real place in history. He proves to be part of a long tradition of "dying and resurrecting Gods" as mentioned above. He isn't a new beginning, but actually the closure of a particular time. A. Because of the monopoly of the Church people were prevented from "dying and resurrecting" themselves. That explains why Western culture hasn't been able to spiritually regenerate. If you cannot "die", the old within you is accumulating, eventually you suffocate in your own waste. A. By the way, "born again" Christians don't really die and thus aren't really reborn*. They just shift from one identity to the other. Before they were identified with common life, now they are identifying with Jesus. Everything takes place e.g. remains on the level of the personality, only. On the other hand, through real "death and rebirth" the ego disappears into Nothingness, while a totally New Dimension - your True Self - is being born out of it. Q. So, the whole idea of someone "dying for you" is backward. A. Because of Jesus "dying for us" people didn't need to die themselves..... They could go on with "business as usual". So it had a completely adverse effect. Their ego's grew bigger and bigger, increasingly destroying nature. Nowadays, mankind is on the verge of killing itself. This is the extended meaning of the "Hour of Truth". So, indeed, "Jesus dying for us" didn't work. Instead, we ourselves (our ego's) "have to die" in order for the Whole to survive. A. Ego is the unconscious identification with your self-image. Hence, its self-centered attitude. "Death" of the ego means ending its "independent" behavior, while giving him back the function he should have: that of a servant. A. While doing so - through meditation, surrender, compassion, selfless service - you will make the shift from unconscious identification to your inner observer, your True Self, your Divine Spark within. A. Once the latter is established, everything that comes up to your mind, will freely float, while subsequenty passing by. Only the relevant things you consciously! identify with. The rest is irrelevant and will "die". It prevents you from accumulating rubbish inside. Q. Back to you and your mission. Why you think you are "a new beginning" in this regard. A. Through my Threefold Realization I was granted the deepest possible insight in Life. Additionally, isn't it a surprise, that where Jesus ended his life with "death and resurrection", and Buddha entered Nirvana on his death bed, I started with them? * It is just a coincidence of course - a metaphor for the fact, that the Ultimate is revealing itself to countless men and women - but from that moment on, my life was determined. It "only" took about 33 years before I considered myself worthy. * My spiritual Path started with Great Experiences: all sudden, "out of the blue", for which I was totally unprepared. See "Threefold Realization", emphasizing once again, that "death and resurrection" is spiritual, not physical. Q. A sense of continuity, of connecting where others ended? A. Like many others I consider myself to be part of a universal tradition. As said above, a tradition that includes many people of all times. On the other hand, I am the beginning of a new tradition, too. A tradition that will change people as well as the world (...) Of course, this isn't due to my own credit, at all! Everything that "I achieved" happened despite of me. Q. Why did you need such a long time to come to the open? A. Good question. It is because I had to upgrade my weak, slothful, fearful, pain-loaden, anger-inflicted personality in such a way, that it would become suitable of being an instrument to the Beyond. An almost impossible task, indeed! Q. Would you like to tell more about that New Tradition? A. It is all about the need for renewal. "Everybody" has to die to the old in order to be reborn. There is a real urgency about it. Because, if we don't "die" voluntarily we will involuntarily. It is a new step in Western spirituality. A. Secondly, the question "into What the ego dies?" is crucial. It gives an entirely new meaning to Nothingness. It is THE taboo of the West*. Already Aristotle denied its existence, while St.Augustin denounced it as "the devil". From that moment on Nothingness has raised existential fear to all. Q. So we need spiritual hospices? A. Good joke indeed! Actually, the problem is quite serious. For instance, only those are able to "die" who already have an ego! What about all others - think of newer generations - who don't have an established ego (at all). On the other hand, it is amazing how many committed people stand up nowadays: youth, adults and seniors alike. Q. Many who have lived with big ego's are increasingly fed up with it. They look for spiritual liberation. A. It usually means, that "death and rebirth" is only for those who dearly long for spiritual renewal. Let's hope that there will be many leaders among them, because that is what is desperately needed! A. Here the big surprise and consolation for many: "Nothingness" can be considered a Cosmic Womb. It is the second Great Renewal in what I call The Original Tradition. In fact, it is the re-emergence of the Oldest Tradition on earth, where everything was considered part of the Great Mother. A. If Nothingness is in fact a "Womb" or "Mother", then we should be able to surrender our ego's to it, without (too much) fear. "She" appears to be the Vessel of Transformation - indeed, the Holy Grail - out of Which everything, including the Light (God) is born, while continuously returning to their Origin. Q. Inviting us to surrender? A. Right. Insight into the Womb gives us the security, that while surrendering, we will be renewed. Isn't everything else - nature for instance - continuously renewed by "Her?" Our "gains" will be a New Self, from simple awareness to Full Enlightenment. This isn't a once and for all event, though (like in Buddhism), but an ongoing (spiral) process to more and more maturity. Q. So, death and rebirth require the existence of a Dark Womb? A. It includes a total re-evaluation of Darkness. While in ancient times Darkness was considered to be the Birthgiver of the Light, in later times this knowledge got lost. The emerging ego started to having fear for it. So, they put it against the light. Overcoming "darkness through the light" is THE obsession of fundamentalists until this very day. A. It is based on ignorance and fear. It explains their fanatism. Ultimately, Darkness and Light are two side of the same coin. Christian mystics like John of the Cross have extensively reported about it. "Darkness gives me all the Light I need" he wrote. Q. Once realized this, how to proceed? A. The first step is "Returning to the Origin", the second "to become Renewed". This isn't the final thing, though. Your New Self has a mission. It has to become fruitful. That mission is to include existence. I call it "to become part of the Whole (once again)". Q. Why is that, considering that the New Self is already inclusive by its very nature? A. Great! This shows you have deep insight, indeed. In practice, this is not so simple, though. While the New Self is limitless - however, having many different qualities! - the ego - which sooner or later comes back on the stage, isn't selfless at all. From that moment on, events can go to various directions. A. In the old days, the culture - the master, the monastery, the community - guaranteed a favorable development, e.g. keeping the self-gratifying efforts of the ego to use the situation for its own benefits, to a minimum. A. Nowadays, our culture is even promoting this! It means, that without working on a regulating spiritual, religious and cultural context all efforts toward spiritual liberation will be in vain. What happened to all those self-acclaimed enlightened ones, nowadays? How many have resisted greed for power and money? A. So, I am extremely happy to be able to announce that The Original Tradition has found that context. While apparently destroyed by the Church it proves to have re-emerged. This miracle is called "Green Men" and "Wise Women". Q. I feel your excitement, so something special must be there about them. 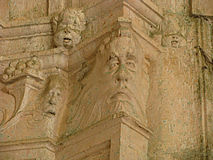 A. British authors* were the first who discovered and described the strange faces they saw in and outside of their medieval churches. Usually a man's face embedded in foliage. First they interpreted them within the context of their own customs, especially the events around the Maypole. A. Later they deepened their understanding, including the "dying and resurrecting Gods" from ancient times. I am infinitely indebted to these authors, because what they found corresponds entirely with my spiritual Realization. A. So, when W.Anderson writes that the Green Men mysteriously emerge from "Dark Nothingness" while disappearing again, then I know where he is talking about from my own experience. Myself, together with these ancient Gods are in the same tradition: that of Green Men. Q. Why has this a significance for the whole of the culture? A. Green Men and Wise Women emphasize the necessity of becoming fruitful. Being reborn isn't enough. You have to subsequently return to the world and become inclusive. This starts with restoring harmony with nature. 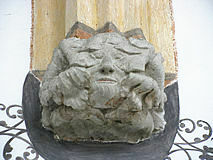 It is symbolized by these foliate faces. Q. Don't most traditions speak of returning to the world after spiritual Realization? A. They do. Their compassion, however, is always from a distanced position. In fact, they reject the world as it is, while doing something good for those poor devils who still live in ignorance. Green Men and Wise Women are different. They are Realized people, while simultaneously participating in the world around them. Q. That is a very crucial point, I think. What else could be said about them? * Because Green Men and Wise Women courageously return to the Origin in order to become renewed, they are also called "Originals". A. The lesson for the culture is this. Not the ego should be dominant, but the archetypes, the deeper patterns in our collective unconsciousness, should. It is an invitation to listen to these archetypes, and subsequently re-arrange our lives according to their guidance. Q. Didn't the women movement already do a lot to investigate women's identity and its role in the world? A. The irony is that in order to making career - which by the way is based on the drive of the "animus" (male aspect) in women to realize itself, thus confirming the point I made - women forgot about creating an optimal context to become fruitful. So, what you see nowadays is, that emancipation of women is leading to a support of patriarchy, capitalism and all the rest. A. Again a paradox: the "oppressing class" is in great trouble. Contrary to women, who are more conditioned to hearing to their feelings and inner voice, men's identity almost entirely relied on outer things, only. Now that his outer world is rapidly broken down, many of them feel shattered. It starts with schools where boys are confronted with learning superiority of girls. Q. That looks rather gloomy. Think of armies of desoriented and uprooted men, being an easy prey to manipulation, dictatorship and violence. A. Within the current paradigms, it does. It underlines my point that only with creating a new context, new meanings, new relationships, new courage and new perspectives can be found. We have to renew ourselves on all levels in order to enter a next phase in evolution. A. Some time ago I was still quite reserved about contributions our Western culture could make. I saw in it the problem, not the solution. With the Cosmic Mother as the Ultimate Reality, the Source of death and rebirth, I am much more "optimistic". It will depend on igniting enthusiasm in as many people as possible. Q. To achieve that, I think, it is necessary for you to elaborate on "Green Men" and "Wise Women" more. After all, you expect people to identify with these new/old archetypes. A. From the very beginning my work has been women-centered. It focussed on spirituality, mythology, gender, social oganization etc. The Green Men make it possible - for the first time - that a balance can be achieved. That's why I am very happy to be able to concentrate here on "Green Men", mainly. He is (yes) the hero, who is continuously giving up his ego to the benefit of the Whole. A heroic servant, who knows about and acknowledges the Source of his renewal: the Cosmic Mother. A. The tradition of "dying and resurrecting Gods" went through several stages. Originally it belonged to the omni-potent qualities of the Great Mother. F.i. 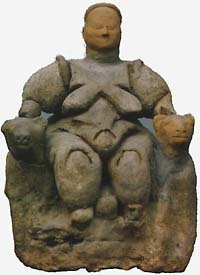 Inanna - the Sumerian MotherGoddess - descended to the Underworld Herself. Later this function was delegated to Her Son/Lover. In the course of time he "played the role" of vegetation God, of mystery God (Hellenism), of a Celtic God (Cernunnos), savior of mankind (Christ), while recently the emphasis lies on spiritual rebirth for all*. Q. You mean in the course of time the Green Man went through a process of evolution? A. Yes. 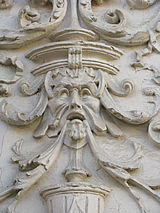 It explains why The Original Tradition is obviously including the Green Man as vegetation deity, but doesn't limit itself to it (like Wicca and Neo-Pagans do). The reason is that "death and rebirth" takes place on all levels of existence. Ultimately culminating in the Cosmic Mother, Who, in these most critical of times, is inviting everybody to spiritually (ego) die, in order to become reborn as a True Self, while subsequently becoming part of Her web of life, once again. Q. This was revealed to you in 1977 when you were granted the Threefold Realization? Q. How relevant this was (and is)? A. That the Mother is the Ultimate Reality, and not just an image, concept or idea. She is the unfathomable Depth, from Which the Light (God) is born. Through continuous surrender e.g. rebirth, the Son/Lovers to the Mother (e.g. the Wise Women) will be granted Self-Realization, the insight about who they really are. For men it means that they become a GodMan, embodying the eternal Cycle of Birth and Death. They thus will become independent from primitive and transient identification mechanisms as they are provided by society. A. He will be not alone in that. An entire tradition - The Original Tradition - supports him and his spiritual Path. He will be in line with all great predecessors, all "dying and resurrecting" Gods: from Tammuz to Osiris, from Attis to Baal and from Dionysos to Jesus*. This Tradition has thus three pillars: 1. Back to the Origin 2. in order to become Renewed, while 3. being part of the Whole, once again. A. 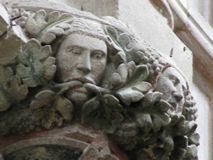 As you know Hildegard of Bingen, the visionary mystic of the 11th century called Jesus "The Green Man"*....This is in sharp contrast to a Church that for 2000 years! has consistently and ruthlessly condemned, denounced, villified and cursed nature as "work of the Devil"....It was the Church that destroyed the sacredness of the earth......Of course, we all have to cooperate - Christians and non-Christians alike - to save the earth, no question about it. However, a Church who behaves like the "champion of stewartship of the earth", on the one hand, without the slightest inclination to seriously remorse and repent, on the other, proves that its traditional hypocrisy is still unchanged. * The reality: Jesus is part of the Green Man tradition - of Tammuz, Osiris etc. that was already there thousands of years before Christ - and not vice versa. * Martin Luther, otherwise not very "mythical", had a Green Man printed on the title page of his "Appeal to the General Council". 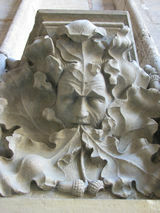 He also preached from a pulpit with a Dragon (Great Mother) and a Green Man (born out of Her!) carved on it.....(W.Anderson). * Erasmus too had one book decorated with a Green Man. A. 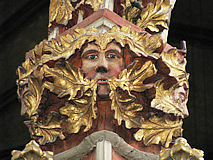 Green Man's role is that of a Servant/Messenger. He is fully Realized, yet, is doing everything "in the Name of the Mother", his Origin. His Consciousness is inclusive, taking care of the world, nobody and nothing excluded. However, not from a priviledged, distanced position, but as one among many. That's why he shares the life that others suffer. His approach is linked to people's true needs e.g. he gives you that, which helps you to become reborn*. A. Because he experiences and acknowledges his feminine part ("anima") he will become a great partner to women. He sees in her a Wise Woman, a Goddess whom he adores on the basis of equality and solidarity. Her wisdom, originating from a great sensitivity will be greatly appreciated. On the other hand, she will be delighted to relate to a true man*. * This is not excluding homo relationships, at all. In those relationships there is always a "male" and a "female" pole, as well. So, the same can be applied to them. Q. So, is this the Hour of Truth? A. Have you seen the films about the earth by Yann Arthus-Bertrand? They are most impressive. See it and you will fall in love with our home, the planet. It is sooo beautiful. That's why it is unbearable to see the damage we are inflicting on her. It brings you to the core of the matter. An outcry will come up from the depth of your Being: "we have to save the earth!" Q. What are your practical proposals? A. First of all we have to recognize that the global crisis is essentially spiritual. "To have is the inability to Be". The problem is that people cling to having, because they don't know anything better in life....That's why they are addicted to power, money and the rest. Secondly, how can we create a New World, if we don't renew ourselves first? A. We are standing with our back against the wall. There seems to be no escape. Only a New Consciousness will give us new perspectives. That's why we first have to go back to the Origin in order to become renewed. It is the beginning of a worldwide TRANSFORMATION. Green Men and Wise Women are taking the lead. They will guide people in discovering their surplus value in life: their innermost Core. A. Once your New Self is born - discovering inner clarity, wisdom, balance, joy, love, friendship, strength, community and commitment to the Whole - concentric circles are drawn toward your immediate surroundings. You become a beacon of light, shining to all directions. You are not doing it, but the Light within is. Without any effort on your part, it will achieve miracles in and around you. A. So, the Hour of Truth is a worldwide call to all aspirant Green Men and Wise Women to join the Transformation/"Healing the Planet in 7 Steps" initiative....The TRANSFORMATION is inner and outer. It is both simultaneously. Together we celebrate the beginning of A New (Wo)Man, A New Tradition and A New World. Our deepest longing is to restore the Wholeness of Life, including all "sentient and non-sentient beings", without exception. A. Maybe one good idea at the end. Isn't our youth desoriented, with no perspective at all? They need a new "role model" to begin with. It should give them a new foundation in life, with promises for a meaningful, sustainable and joyful future. 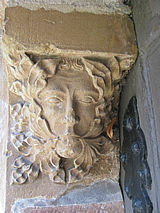 * Green Man carvings are most prominent in Britain, France, Germany and Spain. Q. Halleluia!, and thank you very much for your elaborate answers. A. Her Blessings to you and your dear ones!